Sudbury bed and breakfast travel guide for romantic, historic and adventure b&b's. 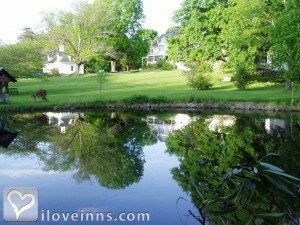 Browse through the iLoveInns.com database of Sudbury, Massachusetts bed and breakfasts and country inns to find detailed listings that include room rates, special deals and area activities. You can click on the 'check rates and availability' button to contact the innkeeper. Just walking through the main thoroughfare in Sudbury, Massachusetts is traveling back in time. The entire town just seems to be plucked out of the pages from a history book. Early 19th-century buildings still exist and are standing proud despite the years. About three miles from Sudbury is the Old Grist Mill Museum. This museum is a replica of the original that was built sometime in the 1740s. Due to the many historic sites in the area, the town is also called the Sudbury Center Historic District. Among the more prominent of these Sudbury sites are Wadsworth Cemetery, Israel Howe Brown House, Goodnow Library, First Parish Meeting House, and Grange Hall. People who go to Sudbury also visit the Ralph Adams Cram House and Chapel. Baseball aficionados also make it a point to go to Babe Ruth House. Sudbury bed and breakfast inns are easy to find in the area. By Inn on The Horse Farm.